Vietnamese silk embroidery took me completely by surprise. My friend Tara and I had jumped on a plane for a spontaneous, whirlwind two-week trip to Vietnam, with no preparation except the purchase of a Lonely Planet guide. We were giddy with the possibilities: We could choose our route and places to visit on the fly, spending days or just hours in each town, taking a train, plane, or bus. The whole country lay ahead of us. Each night we consulted the book, selecting the next destination by the beautiful dress of the ethnic people, or its interesting local market, or the reputation of a museum. 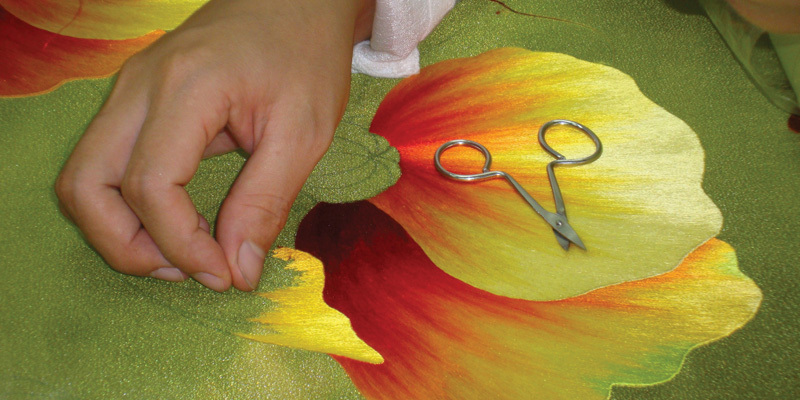 Embroiderers at the XQ Center in Huê, Vietnam, working a large piece with poppies. When we walked over the ornate bridge in the pretty coastal city of Hôi An onto a street of embroidery galleries, I realized I knew nothing about an impressive textile tradition. The embroiderers represented in the galleries used hundreds of colors of silk thread and smoothly curving stitches that gave depth and fluidity to the shapes they embroidered. Exquisite scenes of people and flowers covered the gallery walls. Depth and shading, form and detail combined to create stunning images. Some places displayed finer work than others. In one gallery, the landscapes seemed formulaic, but in the galleries with the most skillful work, we saw the superb needlework and color-blending skill of accomplished artists. In two or three galleries, young women demonstrated the technique, calmly threading needles with fine silk strands and stitching cloth stretched on a horizontal frame. We met Pham Thi Bong, and I bought her embroidery of a cerise orchid because it was such an unusual composition and image. I loved the way she had shaped the three-dimensional root ball with dozens of shades of browns and tans, as well as the complex sequence she had used to stitch the overlapping roots. Bong worked the same way as the other embroiderers we saw, with one hand under the frame and the other above. She used stem stitch to outline shapes, so that when she filled them in with straight long-and-short stitches, she could work right up to a neat edge. 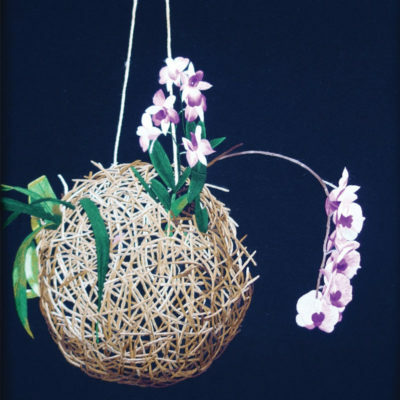 Orchid with root ball embroidered by Pham Thi Bong. Purchased by the author at a gallery in Hôi An, Vietnam. Later, we meandered north to Huê to see the ancient citadel. On the way, we walked by an imposing wooden gate with the words XQ Arts & Crafts across the top. Upon entering, we found it was a huge complex completely dedicated to embroidery. Showrooms alternated with workshops. We watched several women sitting at horizontal frames stitching ornate peonies in fine silk threads whose colors ranged from pale peach to deepest claret. At the next frame, four embroiderers worked together on a long frame, shading huge poppies in sunset colors. For the complete article, please see PieceWork November/December 2016, page 24. 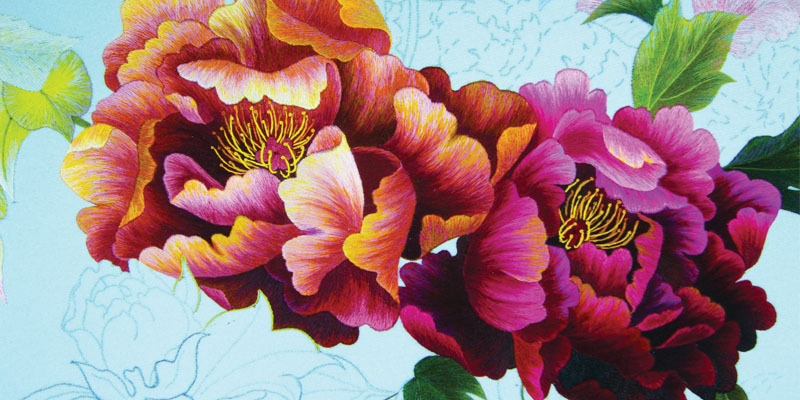 Featured Image: Embroidered peonies in process at the XQ Center in Huê, Vietnam. Note at bottom the outlines in stem stitch and the groundwork fill-in stitches in pale pink at top. Both of these are preliminary steps to the final embroidery. All photographs by Cynthia LeCount Samaké. Explore silk resources in our shop!